Green Pact Stalker is a rare Agility creature card. It is part of the Core Set. "Just follow the trail of blood." "The path is wide and clear." This card's summon ability applies the Culling the Weak card effect. 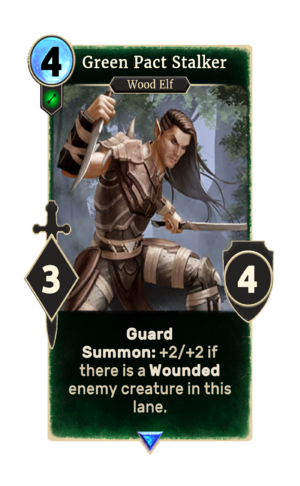 The card's name refers to the Green Pact that the Bosmer made with Yffre. This page was last modified on 16 February 2019, at 22:40.